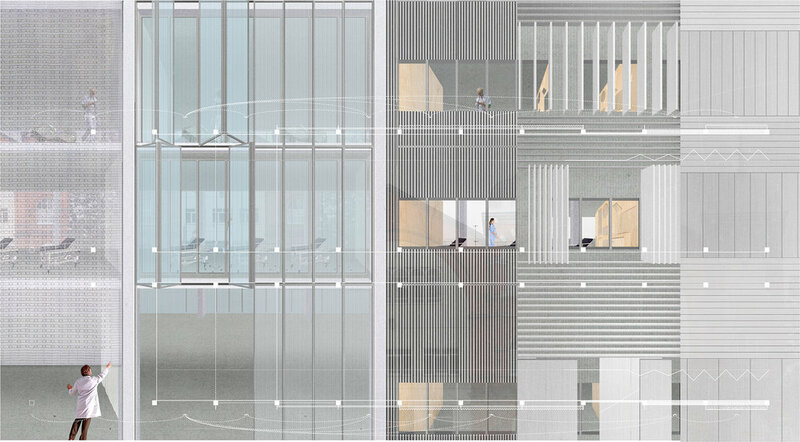 Diploma 13 investigated how engaging with the NHS could force architecture to transcend its role as built capital and reconcile with its social mission. Students mediated extreme scales of the NHS, from the private experience of personal health to the complexity of public funding, in order to systematically alter the way the city functions. 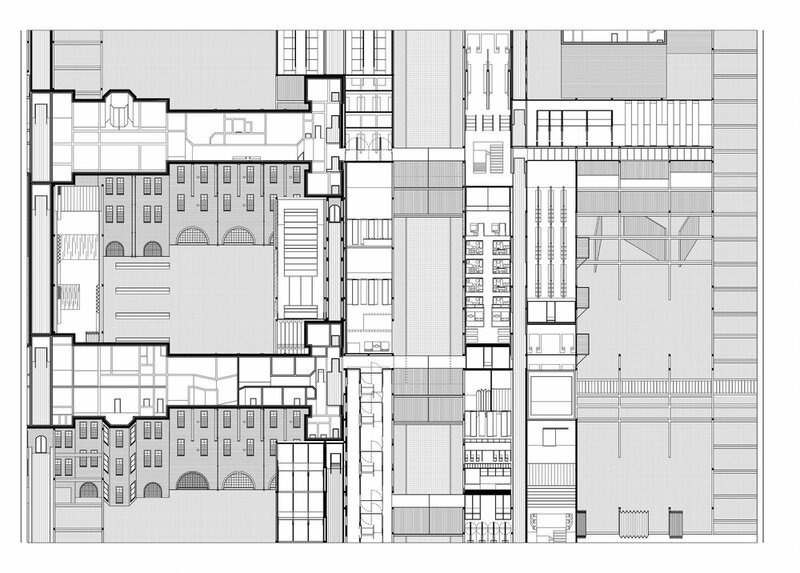 Alex Butterworth choreographed a cycle of construction for Whipps Cross University Hospital that negated the short-termism of current political spending. The Government’s policy of selling off hospital land provided Salvador with the ammunition for ‘Magic Mountain’ Rehab. Maria provided a transformational building for those transitioning between genders, and Marietta reimagined the Government’s new typology of community hospital as a hospital community for chronic disease. The NHS as a place for disease prevention was critically addressed by Harris through his heroic Stadium of Health. Ada invented a new typology for retirement utilising the productive possibility of the ‘Third Age’, with a dairy business that benefitted from a ‘green and pleasant land’ for end of life preparations. Xing imagined a near-future superbug requiring an inflatable field hospital that does not allow patients to die in isolated misery. Using Whipps Cross Alex Paritzky reestablished the hospital as a centre of civic life. NHS Estate land sell-offs provided William with the sites for a halfway house that negotiates between the city and the institution. Pavlos’s accelerated future predicted that healthcare will be dispensed at home by sensors providing real-time feedback to data-doctors. Sebastian used the complexity of time experienced in dementia to create a care facility that allowed patients to live in an altered present tense. John conjured the water leakage of St Mary’s hospital to create a Cloud of Care. The students mediated extreme scales, between the most private experience of personal health, to the complexity of public funding a National Health Service, ultimately aiming to use the NHS to change the relationship between public and private bodies, and to systematically alter the way the city functions. Tutors: Lily Jencks, Jessica Reynolds, Alex Scott-Whitby. Student Participants: Alex Butterworth, Salvador Folque de Mendoca, Maria Concha, Marietta Kakkoura, Harris Karakannas, Ada Keco, Xing Meng, Alex Paritzky, William Pelham, Pavlos Pieridis, Sebastian Serzysko, John Yim. Jury feedback and Workshops provided by: Daniel Bosia, Brett Steel, Barbara Cambell-Lange, Catsou Roberts, Russel Curtis, Peter Lloyd Jones, Linda Davis-Moon, Theo Sarantoglous Lalis, Megan Burke, Charles Jencks, Jessica Turnbull, Ryan Neiheiser, Manijeh Verghese, Owen Hopkins, Jos Boys, Carlos Villanueva Brandt, Samantha McLean, Merma Cridge, Tatiana Von Preussen, Tyen Masten, Miraj Ahmed, Annette Fierro, Javier Castanon, Xristina Argyros, Colin O’sullivan, Jamie Scott-Baxter, Scott Boote, Robert Mull, Osman Marfo-Gyasi.